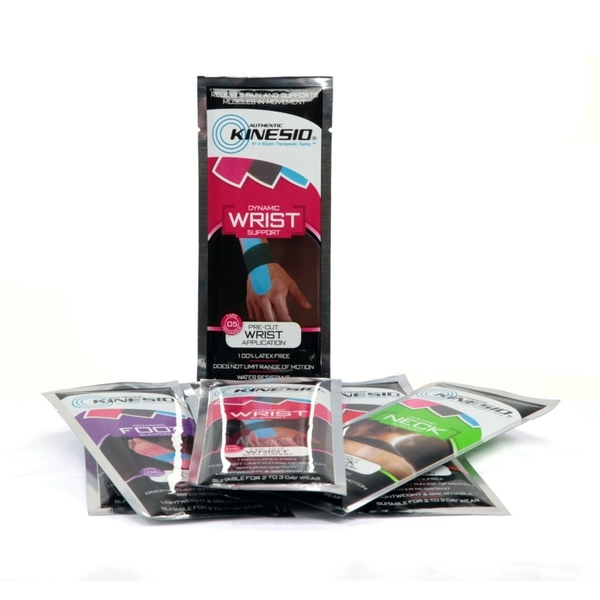 Kinesio® Pre-Cut Wrist applications support the muscles of the wrist to help with carpal tunnel syndrome and any wrist-associated pain. Kinesio Pre-Cuts are convenient, pre-packaged kinesiology tape applications designed to provide fast, effective pain relief and support muscles in movement. Each packet contains a single-use, customizable set of tape strips with step-by-step instructions and measurement guides on the paper backing. Kinesio Pre-Cuts are hypoallergenic, non-restrictive, have a water-resistant coating and are easy to apply. They can be worn for up to 3 days. Tape strips are cut from Kinesio® Tex Classic.